Adi Sankara, one of Mother India’s greatest modern Sages, was born awake to the most sublime desire, the desire to be One and the desire to serve One. He reawakened India to "Advaita" philosophy. Advaita means seeing God in everything, recognizing all that is, including ourselves, is One. Born with a powerful intellect to comprehend such wisdom, it was natural for anyone debating Adi Sankara to surrender to his Source intellect and profound reasoning. Adi Sankara, though awake in the knowing still learned through daily experiences, appreciating them as divine examples to share with others. One day, Adi Sankara was walking towards a temple and his disciples were clearing the people in his path. An ‘untouchable’ caste person refused to move from the path. In those days–as in a lesser extent in India today- the lower caste were considered inferior and untouchable and thier physical presence was deemed to contaminate others. This was a social curse of India. Adi Sankara asked this ‘outcaste’ to move aside. The profound response was in the form of this question: "What do "I" move, The Soul or this body?" This question made Adi Sankara fall at the feet of this person as it woke up the knowing oneness as being the Spirit that dwells in all as different bodies beyond identities. Adi Sankara recognized this man to be the Master, Lord Siva taking up a disguise in order to teach. Much of the ancient wisdom of India had previously been polluted by collective intellectual ego. As they had in other cultures and religions, beliefs had gained precedence over experience. Those were days in India when darkness of ignorance pushed people to begin questioning belief systems. Adi Sankara’s purpose was to alight each with the experience of One to enable seekers of Light to its true essence of compassion, ahimsa, love–and enable freedom to be the experience of Source. Adi Sankara was challenged to a debate by Mandana Misra, a learned and well known scholar. Mandana Misra challenged the philosophy of Advaita. Adi Sankara invited Mandana Misra’s wife Ubhaya BhÃ¢ratÃ® to be the referee. After debating for over fifteen days, Adi Shankara won the debate and Mandana Misra accepted defeat. But Ubhaya BhÃ¢ratÃ®, his wife, then challenged Adi Shankara to have a debate with her in order to complete the victory stating that she and her husband are one. Ubhaya BhÃ¢ratÃ® then posed tantric questions and Adi Sankara, a life long celibate with no knowledge or experience in this area,pleaded for time. He was granted the time. Utilizing yogic powers Adi Sankara entered into a dead body of a king. As a king, he then experienced love making and the role of a householder. As Spirit having the human experience through making love, he learned by experience the primal Goddess Energies. 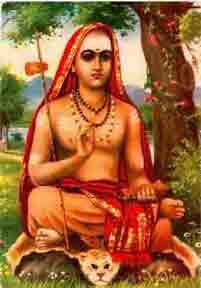 Adi Sankara came back to his body empowered. Ubhaya Bharathi, saw Adi Sankara’s radiant being and without a debate, acknowledged defeat and served Adi Sankara for the rest of her life along with her husband. This story of Adi Sankara explains why wherever Adi Sankara went (he walked through all the 4 corners of India by foot twice, completing his life mission of awakening India to Advaita, the Oneness philosophy- setting alight the "New Age"), he established temples for the Goddess, the Mother Kundalini- the awake human experience. Most of his songs were in devotional surrender to Lord Visnu, the Sustaining Energies–that the Mind is awake to. Yet, beyond all identity, he was Lord Siva, the Knower of Self who was a sanyasi–the Spirit. The above story was told by Gautama Swamy, (a Sage who was residing on the foothills of Thiruvannamalai, the sacred mountain in South India. Gautama Swamy is no more in the physical. He blesses us as Spirit) to Nandhi to illustrate an empowered meditative technique/ ideal especially for puja (the worship of the Divine). 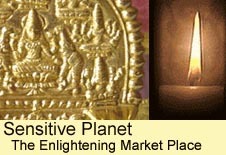 Awaken the lamp as the Goddess and the light of bhakthi as the Goddess to ascend upwards. Climb through the ‘mind states’ to be graced by Lord Visnu, the awake intellect that allows to hold the brilliance of Source. Yet, question who is meditating to kindle the knowing that it is the Self, Lord Siva, in each- our awake Spirit, the soul of One. The mindless mind finds One. With constant thought of One, become One. The trinity awake, purpose is enabled. May our empowered meditative wisdom be graced to create the moment of "now" now. Blessing of each to each!